At the Max Planck Institut für Kernphysik the molecule H3+ is investigated. To understand this molecule better not normal H2 but para-H2 is used as ion source material. The nuclear spins of the two H-atoms of the molecule have two possibilites: parallel (called ortho) or antiparallel (called para). In thermic equilibrium hydrogen at 300 Kelvin the ratio between para- and ortho-hydrogen is 1:3. The para state is energetic lower than the ortho state. 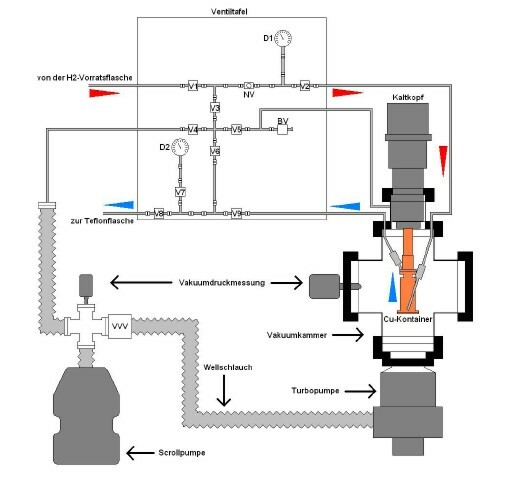 To produce hydrogen gas that consists mainly by para hydrogen normal hydrogen gas is cooled below 20 Kelvin. Because a spin flip is not so likely, a catalyst with paramagnetic properties is in contact with the cold hydrogen gas to accelerated this process. A device that converts normal hydrogen gas to para-hydrogen is called para-hydrogen-converter. 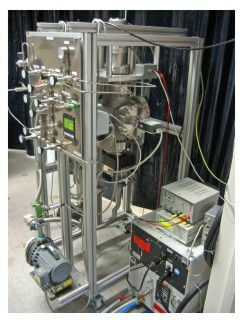 To measure the purity of the para-hydrogen gas Raman spectroscopy is used. This work was done with Dennis Bing in 2006. The following pictures are from the diploma thesis of Dennis Bing from the year 2006 (dennisbing2006) (thanks Dennis Bing for permission to use them). The heart of the para hydrogen converter is a vessel made of ultrapure copper which is connected to a cold head. Raman spectroscopy is a powerful for molecule spectroscopy. In the setup a laser at 532 nm with 500 mW is used. 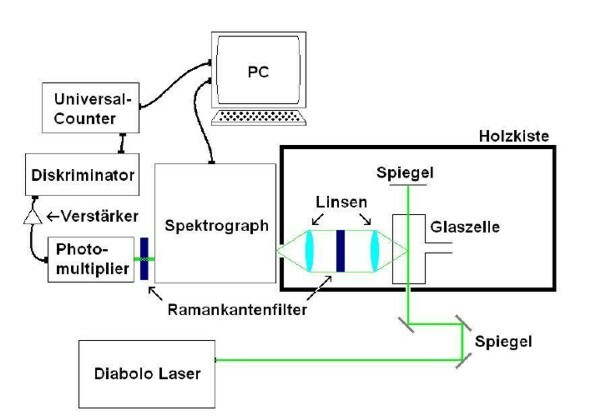 The laser is focused into a glas cell filled with hydrogen and the scattered light is projected into a spectrometer. The output of the spectrometer is detected with a photomultiplier. Due to the symmetrie para hydrogen has only even rotational quantum numbers and ortho hydrogen has only odd rotational quantum numbers. The Raman spectrum of normal hydrogen consist of transition with even and odd rotational quantum numbers. In para hydrogen all lines related to ortho hydrogen disappears. With this setup the fraction of para- and ortho-hydrogen in the output gas of the para hydrogen converter is determinated with an accuarcy of one percent.